The US is a major trade and investment partner for the UK - by some measures the biggest of all. One issue on President Trump's agenda while he is in Britain will be whether - and how - to deepen that relationship. So just how intertwined are the two economies? As a single country the US is the largest export market for the UK. It is, however, well behind the EU when the bloc is viewed as a single market. There is some logic to viewing the EU in that way, as it has a single external trade policy and most of its members share the same currency. “Today’s speech certainly marks a historic moment in UK-US trade relations as it reflects the ambition of the UK government to strengthen economic ties with the US, the UK’s most important single-country trading partner." 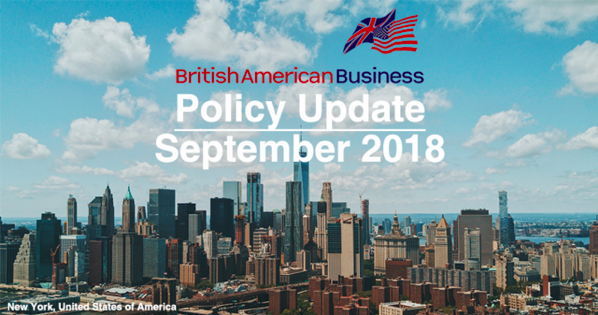 “We welcome the announcement that the US will be one of three priority markets for which the UK Government is launching formal consultations, and we hope that this positive momentum continues in the coming months towards opening a new chapter in economic relations between both countries." There was so much excitement in the air at 5.15am as I entered the doors of the Indian Hills Country Club. Today, Saturday, May 19th, was the day we at the British American Business Council had been planning since the Engagement of Prince Harry to Meghan Markle. It was our Royal Wedding Watch Party. The big screen was already up and showing live coverage from Windsor of all the guests arriving at St George’s Chapel. The staff at Indian Hills Country Club were busy setting up, getting ready for our 75 guests, who would arrive at 5.45am. Our guests dressed in wedding attire. Ladies wore hats, men wore suits, tuxedos and tailcoats. We brought St George’s Chapel to a Country Club in Georgia. Our guest list included people of all nationalities, excited to witness a union between our British Prince to an American Actress. This was truly a unique and historic experience. “It’s been wonderful. A great occasion. Very well put on. Everything was just perfect,” said one guest from South Africa. Our guests enjoyed a traditional British Fare that was a combination of a Breakfast and Afternoon Tea. Yes, we had sausages, eggs and baked beans alongside cucumber sandwiches and scones. To make this event a truly Royal experience, we served lemon cake with elderflower icing, the same flavors as the Royal cake. “I absolutely had a wonderful time and met some very cool people. It was a great turnout,” said another guest. To add to the Britishness, our Bagpiper, who was dressed in a full Scottish outfit, entertained our guests with some traditional sounds from the Highlands. This was a very successful BABC event. A uniquely British occasion, where we offered our guests a once-in-a-lifetime experience. Something they will never forget. BABC-Georgia is a member of the larger BABC with 20+ other chapters. We are pleased to announce the appointment of Stuart Bagshaw as the President of BABC International. BABC has announced the appointment of Stuart Bagshaw as its new President, taking over the role from Tom Stevens, of BABC Chicago who left the role earlier this year. Bagshaw boasts extensive experience in the transatlantic economic space, as current Chief Executive of British American Business LEAP (Land Expand Accelerator Program) LLC and past President, Chairman and current board member of the British-American Business Council Northern California. "I am honored to accept the role of President of the BABC. Having been involved with this organization for almost 20 years, I have experienced the value that the BABC brings to any business with a strong interest in Transatlantic trade. This remarkable network has evolved over the decades helping to promote commerce and cooperation between the USA and the UK throughout its membership. As new governments come and go, the BABC has adapted and adjusted to accommodate policy and political changes on both sides of the Atlantic. London - On 7 June 2018, BABC launched the latest publication in its Trade & Investment Guide series: ‘Finding Your Way: The Trade and Investment Guide to the US 2018/19’. The publication was launched in Birmingham at the Annual BABC Transatlantic Conference, bringing together over 250 business leaders and government representatives from both sides of the Atlantic. ‘Finding Your Way’ was produced by BritishAmerican Business on behalf of BABC in order to provide UK companies looking to either trade with, or invest in the US with a comprehensive and straightforward guide to ensure they do so with the best knowledge possible. The publication offers expert advice from our partner companies, answers to frequently asked questions, and links to useful resources to help these companies on their transatlantic journey. ‘Finding Your Way’ contains features on the main issues UK companies may face when bringing their business overseas to the US including; Immigration, Finance, Insurance, Logistics and Tax – kindly provided by our expert member companies Gibney Anthony & Flaherty, Santander, Travelers, UPS and Deloitte. The guide also features showcases on select states in the US and the unique, business-friendly environments they have created. BAB is delighted to have received the endorsement of both the UK Department for International Trade (DIT) and SelectUSA for this publication. “Britain’s small and medium-sized enterprises are the lifeblood of the economy, accounting for 99.9% of all private sector businesses in the UK. Of these companies, approximately 25% export their goods and services across the globe, over half of whom export to the US market. These numbers illustrate the value and importance so many of Britain’s small and medium sized enterprises identify in the transatlantic trade and investment relationship as a source of growth and success for their business. Our chief goal at BABC is to nurture this relationship further, and help businesses of all sizes share their world-class products with our friends and colleagues in the US. London - On 5 June 2018, Heathrow Airport received approval from the UK Government for the construction of a third runway at its airport in Longford, England, outlined in the latest Airports National Policy statement tabled today by Secretary of State for Transport, the Rt Hon Chris Grayling MP. The proposed £14bn private investment is projected to create approximately 60,000 new jobs and double Heathrow’s cargo capacity, generating up to £74bn in economic benefits. BAB welcomes the UK Government’s support of Heathrow’s case for a third runway, through which it can maintain its position as the UK’s only Hub airport and the largest port by value to markets outside the EU and Switzerland. The UK’s airports are critical in maintaining our connection with the world, both for business and tourism. BAB has long been a vocal supporter of Heathrow’s case for expansion, outlining in its 2018 Policy Agenda its necessity as part of the UK Government’s Industrial Strategy as a driver for growth. Heathrow plays an essential role in the success and future of the UK-US economic relationship, which is worth over a trillion dollars in Foreign Director Investment (FDI) and over £160 billion in trade annually. Every month thousands of travellers from North America land in Heathrow. 87% of American business visitors repeatedly travel to the UK bringing substantial business with them.